Located in scenic Sandyport, this luxury house is a steal. It has a lot of character and is truly a home away from home. This gated community provides tennis courts, pools and playgrounds for children. Just 10 minutes away from the airport, it is conveniently located to every attraction imaginable! Delaporte Beach, restaurants, banks, food store and even the gym are located in walking distance. Best of all, there is a bus stop directly in front of the gate - and downtown is only a bus ride away! Several great restaurants are near by. This is the perfect family vacation home. It has it's own pool, generator and dock at the canal. If you bring your own boat, ask for special arrangements and dock rental. Since you are staying in a gated community, your kids can zoom around without restrictions. The house comes with two bicycles, a kayak (taken by the hurricane - replacement in process) to explore miles of also gated canals, full of marine live. A guest membership for Old Fort Club can be arranged for a fee of $50 per day. Please check with us on membership terms and availability. If you are a scuba diver, we can arrange for a temporary membership in the Bahamas Dive Club, which comes with substantial savings and benefits at local dive operators. Furniture, art and decoration in the house might change and deviate from the pictures. Great vacation rental for short or long term. Great backyard covered deck along with a pool for cooling off. Convenient location near beaches, restaurants, grocery stores, etc. Casa Siam was perfect for what we needed for a family get-together! Charleen assisted with any questions once on site and leading up to the reservation Nordin helped us coordinate not only the amazing club access (definitely a must do!) but also a slip at the marina for guests who were arriving by boat. We were 6 adults and 2 small kids and the house was great. We spent most of our time outside and cooked all meals at home between the perfectly appointed kitchen and the grill on the patio! When I researched a place to stay, Casa Siam had all 5 star reviews...now I know why!!! This was our first time traveling to the Bahamas as a family and we loved the experience! Casa Siam is the perfect place for any size family (we had 9) with plenty of space to wine & dine, play card games, swim and even spend some alone time! The back deck and pool area is spacious, beautiful and allows for comfortable unwinding after a long beach day! There are plenty of restaurants and beaches within walking distance as well as buses and taxis to take you up an down the island. Nothing is too far away from Casa Siam! Our families favorite restaurant was this little Italian restaurant called Capriccio's...with a Chicken Parmesan dinner to die for! Casa Siam is in a gated community which gave us a great sense of safety, security and privacy...yet allowed us to be very close (walking distance) to all worthwhile activities. This was truly our best vacation yet!!! Nordin was a very friendly and accomodating host...we will definitely return in the near future. Great house just outside the tourist areas. We stayed for 8 days over Christmas. There were 8 of us. Sleeping accommodations were perfect; 1 king and 3 queens. Outside covered patio area was beautiful to hang out, play cards, and enjoy the warm Bahamian air. Pool was perfect to cool off or let the kids splash around. There is a larger community pool for laps a few houses down and was practically a private pool as no one was ever there. Large charcoal grill was nice for steak dinners. Highly recommend Solomans for groceries. There are a couple other places closer, but Solomans is worth the extra 10 mins drive for fresh fish, produce, and meat. We rented a van. House is about a 20-25 mins drive to Atlantis and less than 10 to the Baha Mahr for a nice casino. Strongly suggest a car. Didn’t see a lot of other transportation options. Mr. Siam was very helpful and pleasant as well as his assitant Charlene. Only downside was water pressure in the showers. Very light (I prefer hard pressure) but that is probably just the way it is in the Bahamas:) Kitchen is well stocked. We couldn’t figure out how to use the can opener and we are pretty resourceful so either needs a new one or ask how to use! :) We chose to utilize the guest membership to Mr. Siam’s Old Fort Bay Club for a small daily charge. Absolutely beautiful beach!!! Definitely a must and worth the money. If going during peak time may need to wait for towels and a chair, but the sand is soft and clean so we sat on the beach and was in the water as we waiting for an open seat. If you don’t mind staying on the beach and seeing the ocean from your room, this is a great choice! Will definetly stay again. We had a wonderful stay at the canal property. The house itself is lovely, with spacious rooms on the second floor, and a big open dining room/living room on the main level. Everything was clean and well maintained. We loved the covered outdoor patio, and ate breakfast and lunch out there everyday. There is a speaker outside so you can listen to music, and being right by the canal makes the air a little cooler and gives you great views. The kitchen had pretty much everything we needed, and they even got a drip coffee maker for the kitchen at our request. (the nespresso machine is nice, but you need to bring your own pods, and after a few days we found we were going through more of them than we thought we would, and getting dangerously close to running out of coffee :o ) . The only improvement i would suggest, is that the knives in the kitchen were very dull and could use a sharpening. The grocerystore and liquor store are a 10 minute walk away which was really convienent, and there is a small secluded beach a 5 minute walk away. We have stayed on the island before, in a house that is further west, and preferred this location. It is close to ammenities, but still far enough away from downtown so you avoid the crowds. All in all, a wonderful vacation spot! This caribbean style house is situated in Sandyport, which is on the western side of the island. It is just a ten minute drive from our international airport. The house has four bedrooms, three baths. 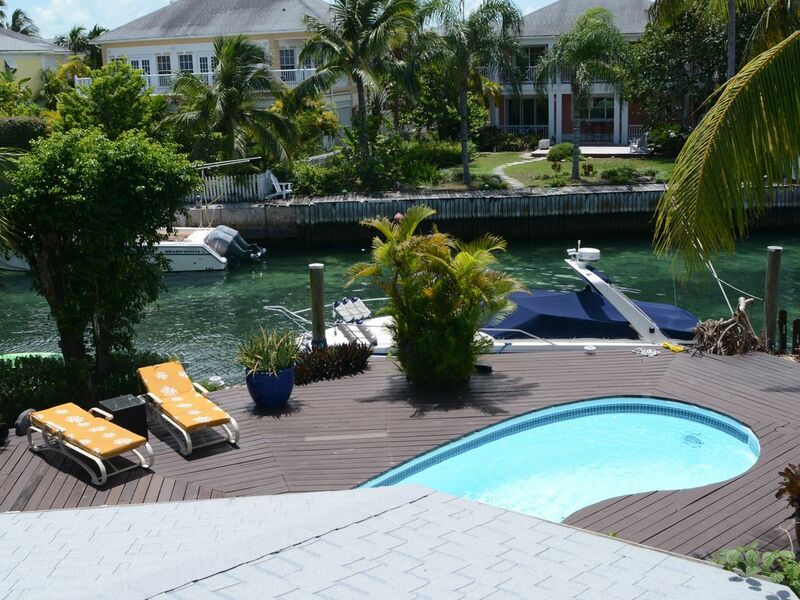 All bedrooms are located on the upper level of the house with balconies with great views. Sandyport Olde Towne with it's shops, restaurants, bars and spas is located , medical clinics, banks, gas station, beauty salons, spa and gym. The property has 24 hour security, and in case of a power failure our unit is equipped with an automatic generator. The beach is just across the street from the entrance to Sandyport. Also there you will find the local #10 bus transportation which takes you into the Cable Beach area or downtown Nassau for $1.50 per person. Or if you choose to rent a car we can assist. Once you are downtown you can purchase a lot of Bahamian souvenirs. The world famous Atlantis will just be five minutes from downtown, there you can explore the undersea adventures, or if you are interested in Scuba Diving there are several Dive operators on the island. which will give you heavy discounts with the local dive operators. Let you know and we will send you an application. Should you prefer to relax at Nassau's most exclusive beach we might be able to give you a guest membership and the prestigious Old Fort Club. We are here to make your vacation a joyous and rememberable one! Rates are subject to changes until reservation is confirmed. Housekeeping will come in one day a week for a 150$ charge.